Dr. Denise Chang underwent a Physical Medicine and Rehabilitation residency at Columbia University's New York Presbyterian Hospital which inspired in her a strong interest for the treatment of acute and chronic musculoskeletal pain using concepts of Integrative Medicine. In addition to being certified in Medical Acupuncture by the UCLA Helms Medical Acupuncture for Physicians program, she has studied Acupuncture and Traditional Chinese Medicine at well-renowned universities in Beijing, China. Dr. Chang is currently practicing at Advanced Pain Management in Wisconsin. Physical therapists utilize a combination of interventions to achieve pain relief for patients. Such interventions can include and are not limited to exercise, stretching, various manual techniques such as massage, myofascial release, primal reflex release technique, etc., and various modalities such as low level laser therapy, ultrasound, TENS, etc. Another intervention that should be considered and maybe useful in adjunct to physical therapy is acupuncture (1). 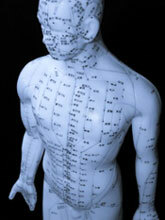 Acupuncture is a form of Chinese medicine which has evolved and has been around for over two thousand years. It is an intervention which provides a means of peripheral stimulation for pain relief (2) and has found its greatest acceptance and success in the management of musculoskeletal conditions such as soft tissue contusions, acute muscle spasms, musculotendinous sprains and strains, and impingement syndromes (3). Chronic musculoskeletal pain problems are also commonly and appropriately treated with acupuncture along with other more conventional therapy. Those problems most likely to respond are repetitive strain disorders, myofascial pain patterns, arthralgias, especially osteoarthritis in nature, degenerative disc disease with or without radicular pain, pain following surgical interventions, and headaches (4, 5, 6, 7). The report from a Consensus Development Conference on Acupuncture held at the National Institutes of Health (NIH) in 1997 stated that acupuncture is being "widely" practiced--by thousands of physicians, dentists, acupuncturists, and other practitioners. In the hands of properly trained practitioners, acupuncture is a fairly safe discipline. Relatively few complications from the use of acupuncture have been reported to the U.S. Food and Drug Administration (FDA). Many patients report a sensation of well-being and relaxation following an acupuncture treatment. More common adverse effects were local bruising, pain at the needle site, light-headedness, and minor bleeding. Regulations of acupuncture is a state by state basis, 44 states currently have legislation in place. Some have their own licensing examinations, while many accept those of the National Commission for the certification of Acupuncture and Oriental Medicine. “Currently, there is no national standard for third-party insurance coverage regarding acupuncture, but coverage is increasing. In 2002 33% of employers offered acupuncture as a covered health benefit, and by 2004 this had increased to 47%. Medicare and Medicaid do not reimburse for acupuncture” (8). 1. Furlan AD, van Tulder MD, Cherkin DC, et al. Acupuncture and dry-needling for low back pain. Cochrane Database Syst Rev. 2005;(1):CD001351.